Our Short-eared Owls and Little Owls have never been easier to see and pretty much every single visitor to the island in the last week or so has had amazing views of either a shortie, a Little Owl, or both. 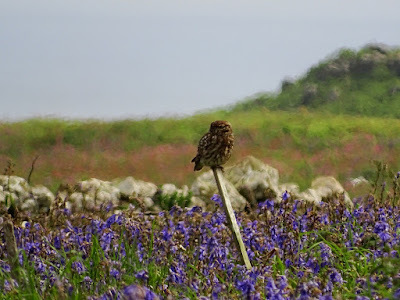 Often multiple shorties can be seen at the same time, mostly hunting or heading back to young with a vole, on the ground or perched on a fence post, or sometimes circling high over the island. We reckon that eggs started hatching around the end of the first week of May and since then the activity of the adults has gone through the roof. 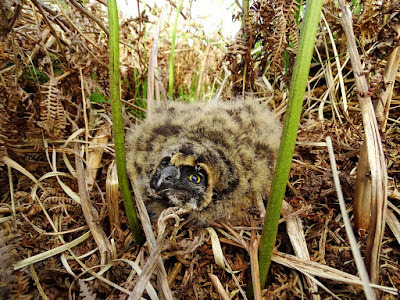 At least four pairs of shorties are nesting this year, as well as the usual pair of Little Owls. They have become quite habituated to people, hunting and flying extremely close as they go about their business, offering fantastic photographic opportunities. Can you spot the little owl? How about now? - Little owl on one of the old walls. 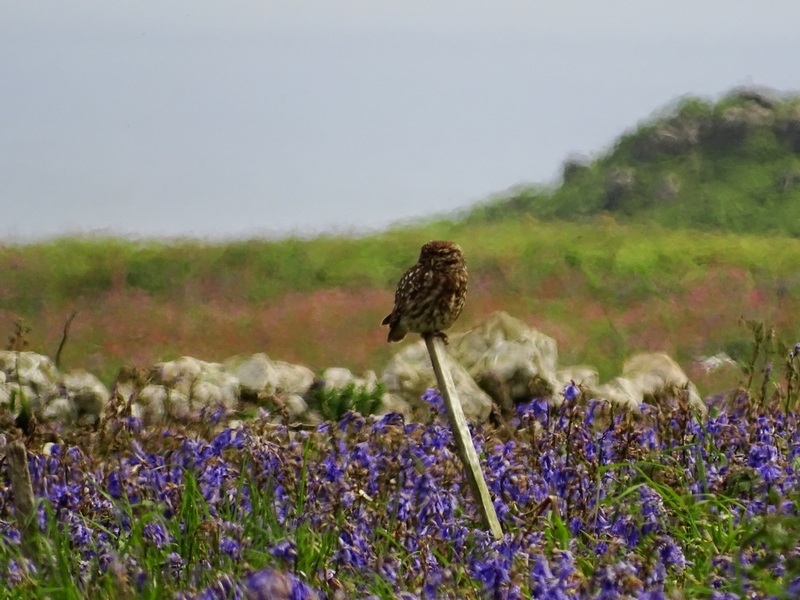 Short Eared Owl hunting over the bluebells just in front of North Pond public hide. 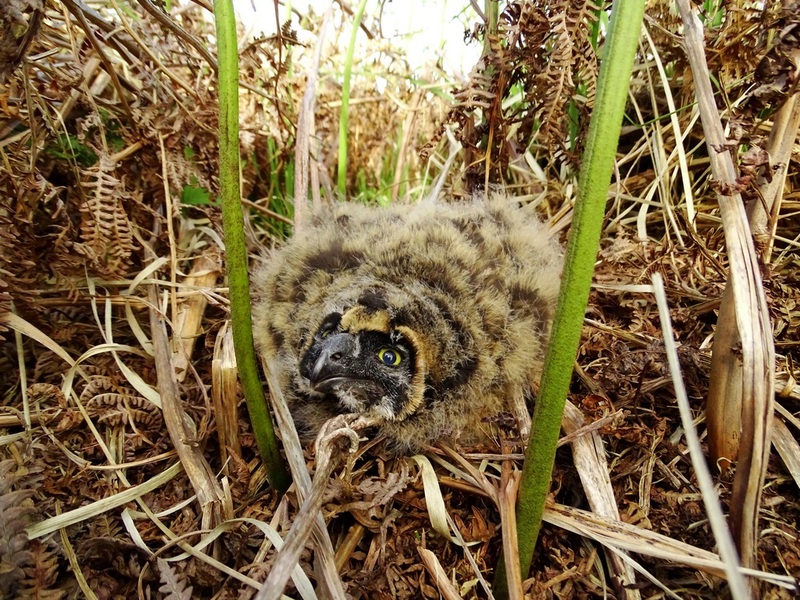 It seems to be quite a good year for shorties, at least in Pembrokeshire, as Ramsey have two nesting pairs for the second year running and Skokholm have the first nesting pair in recorded history. So it's never been a better time to see these wonderful birds in the wild. 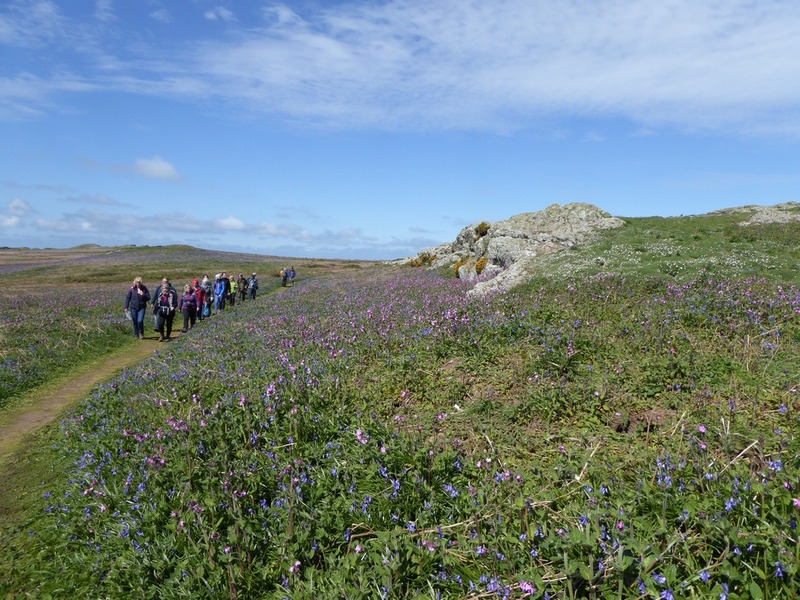 Skomer Island is not only a wonderful place to see wildlife but it also the place to see an amazing array of pre-historic remains - one of the best preserved remains in Britain. On the 27th of April we organised a history walk and Louise Barker and Toby Driver from the Royal Commission on the Ancient and Historical Monuments of Wales were our guides. We were very lucky that the walk went ahead as it had to be postponed the previous day due to strong northerly winds. However, the weather last Thursday was good even though there was still a rather chilly northerly breeze blowing. 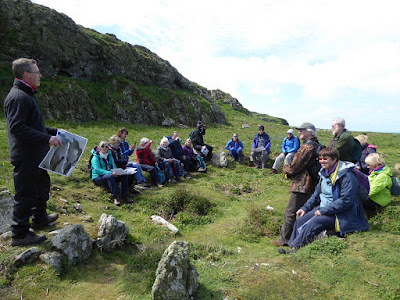 Eighteen participants enjoyed walking around the island and delving into pre-history with Toby and Louise bringing the past to life: we could nearly smell the Iron Age cooking fires and hear the cattle mooing. One of the sites we visited was the roundhouse at the Wick. 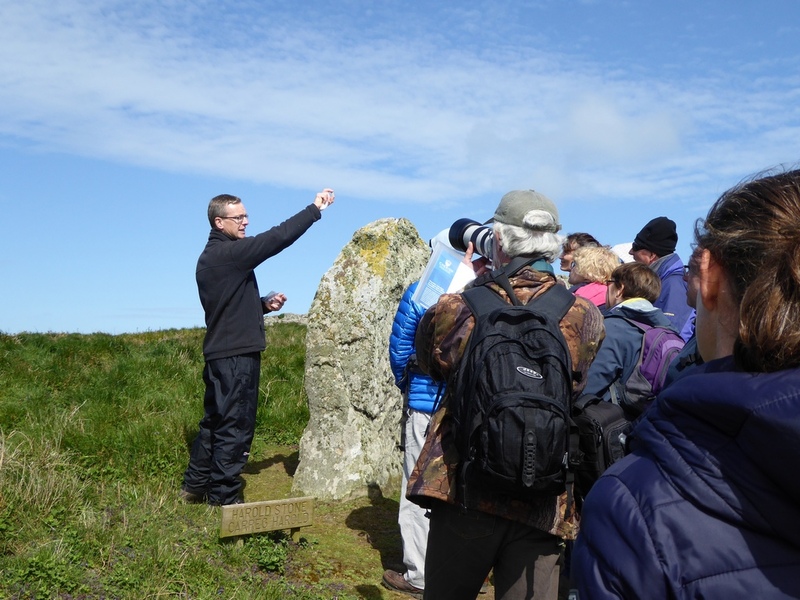 Archaeologists believe that this circular structure was once an Iron Age roundhouse, home to some of Skomer’s earliest settlers. You can still walk in through the original front door. Probably belonging to a farming family, this roundhouse would have been used for cooking, eating and sleeping, as well as providing shelter from the elements. The roundhouse sits at one end of a rectangular paddock, and is located within an extensive prehistoric field system which crosses The Wick. While this hut is the clearest and most accessible, there are many more similar structures dotted around the island. Some are too small to have been used as homes, and are believed to have been used as storerooms instead, perhaps for crops or fuel. One theory is that some could even have been used as sweat lodges - the prehistoric versions of saunas! In 2014 Louise and Toby's team of archaeologists started to excavate some of the remains in order to date them and to gather more information about the former inhabitants of Skomer. Between 5th-8th April 2017, the Skomer Island Project Team undertook another excavation on a deep field lynchet in the southern part of the island. It is hoped that charcoal and luminescence samples (by Aberystwyth University) taken from the lynchet may help to establish absolute chronological markers for key phases in the development of the Island’s fields and settlements, while further environmental sampling (by Cardiff University) will allow the more accurate reconstruction the environmental history of the island. For more information and photos of the dig see here. 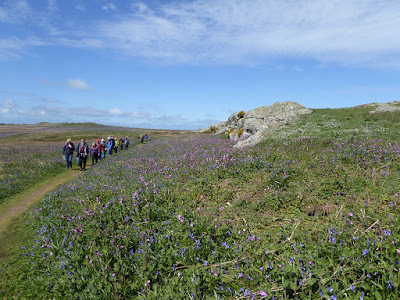 Spring has burst into colour on Skomer, and the bluebells are looking spectacular. I went for a short walk this afternoon and ended up taking over 200 photos (including those below) trying to capture the beauty of the island! 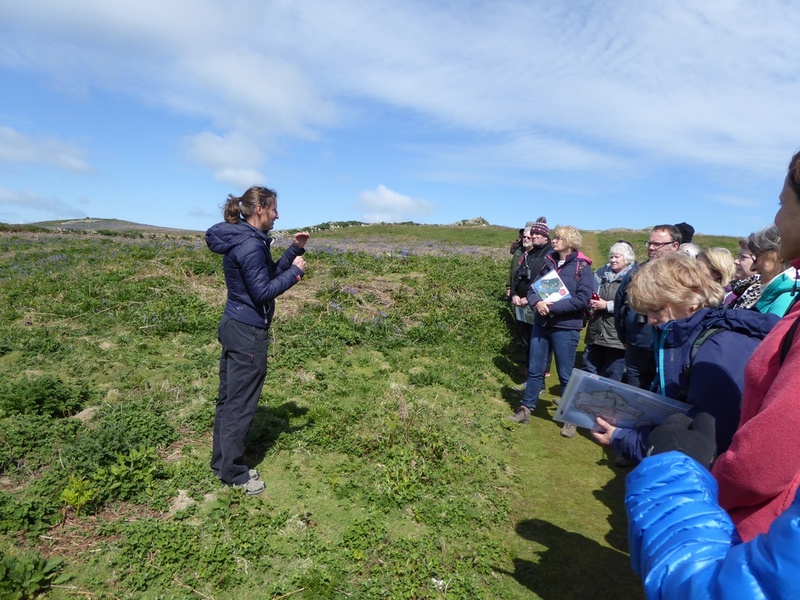 One of the reasons why Skomer bluebells look so spectacular is the unusual ecosystem dynamic. Bluebells are generally found in deciduous woodland areas, and emerge so spectacularly in early spring as they have evolved to complete their life cycle before the trees have come into leaf and the light levels drop. But as you will see, and anyone who has been to the island knows, there aren't any trees on Skomer. On the island the bracken acts in the place of the deciduous trees, shading out other plant competition through the summer, allowing the bluebells (and to a lesser extent red campion) dominance in the spring. Due to the fragile ground, visitors have to lie across the path to take close ups and low angle shots of the flora. If you'd like to see the beautiful colours for yourself we are open every day apart from Mondays (but we are open on bank holiday Mondays). For more information click Here. Looking across South Haven from the path between High Cliff and South Stream. 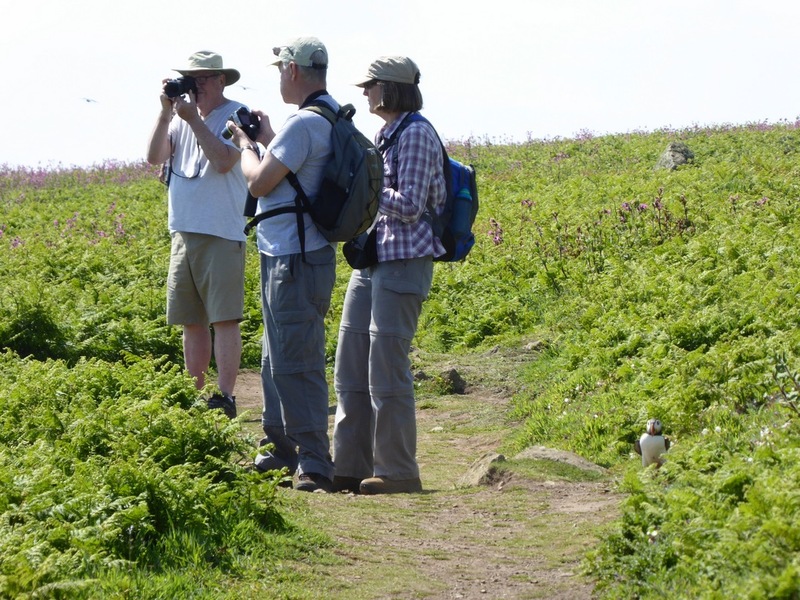 The puffins at Welsh Way have one of the most scenic neighbourhoods with bluebells, red campion and sea campion.